“MICR” stands for Magnetic Ink Character Recognition. MICR encoding is a process by which checks are printed using special magnetic ink and font characters to create machine readable information for check processing. As a check travels through the banking system, a reader-sorter machine sends a magnetic charge to the check which allows it to read MICR information very quickly and accurately. Because of this required magnetic charge, the Federal Reserve and all banks require that checks be printed with a special MICR toner (for the curious-minded, the special ingredient for MICR toner is iron oxide - an excellent trivia question next time you’re hanging around the coffee machine). Laser printers with a special cartridge are typically used to print MICR-encoded checks. Using a MICR solution can transform a blank piece of paper into a complete check printing solution with date, payee information, logos, bank identification and the required MICR line, along with automated signatures, if desired. Organizations that use a MICR check printing application save money and reap the rewards of improved security and flexibility. 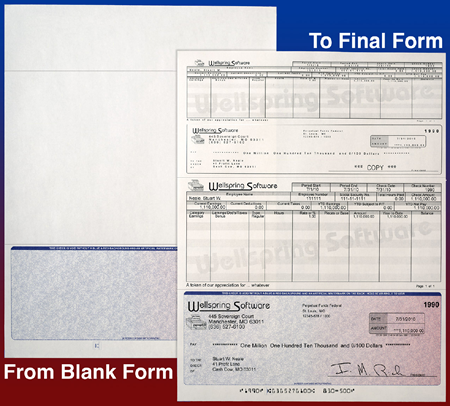 Since MICR software can print the entire check, there is no need to purchase and securely store more expensive, preprinted check stock. And, without the need for preprinted stock, the risk of blank check theft and related fraud is eliminated. Through password protection, new bank accounts can be easily added or old accounts deleted. Signatures can be automatically printed on checks based on custom rules and dollar limits you establish. Use the same paper stock for multiple accounts. Complies with current American Banking Association (ABA) standards. Print logos and signatures directly on the check. Use existing equipment to print secure checks. Optional pressure-sealed solution folds and seals checks so their ready for mailing. Contact us to learn more about a MICR check printing solution for your Sage ACCPAC system. For existing Wellspring PrintBoss users, when running a Windows 7 machine your Printboss version will need to be at least on V5.65.1.